Every child deserves a childhood filled with opportunities to learn, as well as consistent love and support. There comes a time in every parent’s life when you start waxing poetic about your own childhood while pointing out how different things are for today’s children. These ramblings tend to be either over-the-top positive (“We didn’t have much, but we had each other!”) or quasi-sarcastic/judgmental (“Poor baby, you have to wait at a cold bus stop . . . cry me a river!”). Either way, they are almost always ridiculous and say far more about the parent than the child. My own musings on childhood have been informed this month by a new book about the early years of founding father Benjamin Franklin. Historian Nick Bunker’s Young Benjamin Franklin: The Birth of Ingenuity (Knopf, 2018) tells the story of a young man reared in a supportive and ambitious family that prized education, curiosity, and resilience. 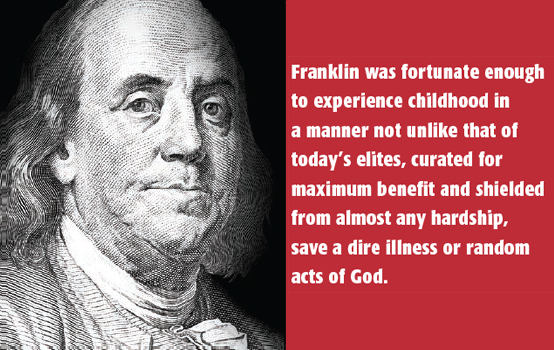 Franklin was fortunate enough to experience childhood in a manner not unlike that of today’s elites, curated for maximum benefit and shielded from almost any hardship, save a dire illness or random acts of God. And like today, all this was happening while an entire population of children experienced no such good fortune. Let us not forget that slavery was a thriving enterprise in Franklin’s Boston, and his family, like many others, benefited from its evils. Still, the childhood he experienced, and which his parents worked tirelessly to provide, helped launch him into the world. Bunker writes that Franklin’s many successes were the direct result of a childhood that included three key factors: 1) an ambitious and loving family, 2) access to educational opportunities, and 3) free time spent building his own curiosity, resilience, and independence. In policy terms, Franklin’s childhood centered around three familiar issues: early childhood education, access to higher education, and social and emotional learning, three of the hottest topics in education today. It fascinated me to think that even in colonial America, these modern ideas were completely relevant. And now, 250 years later, those same factors can still make or break a childhood. Policy makers and education leaders know well that providing all children with the kinds of opportunities and support Franklin had is a lofty, if not unreachable, goal. But federal, state, and local leaders can still make wise investments in the areas that affect children most. Last year, federal policy makers threw some much-needed support and money toward early childhood education by increasing funding for a wide range of early learning and care programs. This issue, with its broad appeal and strong evidence base, miraculously maintained bipartisan support even in today’s kill-or-be-killed legislative climate. State and local leaders are also prioritizing early childhood education. The Center for American Progress (Hamm, Novoa, & Jessen-Howard, 2018) reported that newly elected governors in at least 15 states made early childhood education a key part of their campaign’s platform, promising more support for families trying to nurture and develop their young learners. These leaders recognize the same thing Franklin’s biographer did: Families are the first, and in many ways the most consequential, influencers on a child’s learning and development. Policy makers and education leaders may not be quite so unified when it comes to decisions having to do with K-12 and higher education, but there too, some progress has been made. The Every Student Succeeds Act was a bipartisan effort that finally closed the book on the contentious No Child Left Behind era, and many K-12 programs saw funding increases. Key leaders in both parties recently stated their intentions to finally reauthorize the Higher Education Act by the end of this year (only five years overdue). Despite the other dramas happening in Congress, there is some common ground between Republicans and Democrats on higher education — so the current mood is best described as “cautiously optimistic.” Never mind that the Trump administration has its own ideas about how to manage the federal role in higher education (a role they tend to define as quite limited). It is fair to say that Secretary Betsy DeVos’ actions regarding student debt forgiveness and protections for predatory providers would not pass the Ben Franklin smell test. Same for her relentless push for school choice at any cost. Later in life, Benjamin Franklin shared his social and emotional self in a famous series of books and papers that contain life lessons on virtue, wealth, wit, and wisdom. Franklin was nothing if not a determined free thinker, only limited by his own fortitude and imagination. Nurturing that kind of social and emotional awareness and confidence in children has taken on harsh new meaning in a post-Columbine, post-Sandy Hook, post-Parkland world. Although keeping students physically safe is far and away the top priority for school leaders, there is also a growing consensus that schools need to consider the social and emotional needs of students as well. The last two decades saw an intense and single-minded obsession with academics and test scores that would have no doubt have alienated a student as creative and independent as young Ben Franklin. Today, education and child development experts are focused on a broader set of outcomes for children. It is amazing that it takes an expert-packed commission two years to tell us what we should all know already (and what Ben Franklin clearly knew): A child’s education depends on many factors. In addition to high-quality learning opportunities, children also need time, love, support, and some semblance of personal freedom if they are to grow and develop into capable, productive citizens. The idea that rigorous academics alone can somehow compensate for the many things a child needs to develop has never made sense to me. That argument was at the heart of the effort to evaluate teacher performance using only test scores (a policy that has now been rejected by most state and local leaders). How can we possibly hold one person accountable for the myriad influences and circumstances in a child’s universe? When reminiscing about childhood, none of us should ever forget that in 21st-century America, education and the social and emotional well-being of children are inextricably linked, and all of us have a role to play in tending to both. Today’s socially complicated and globally competitive world requires young people to have as much knowledge and as many social skills as possible. And let’s face it, it doesn’t hurt to be emotionally stable, too! So yes, every child deserves and needs a high-quality rigorous education. But every childhood should include plenty of love, support, and the chance to pursue new and ingenious possibilities. Aspen Institute National Commission on Social, Emotional, and Academic Development. (2019). From a nation at risk to a nation at hope. Washington, DC: Author. Hamm, K., Novoa, C., & Jessen-Howard, S. (2018, November 7). Newly elected governors support expanding early childhood programs. Washington, DC: Center for American Progress. Citation: Ferguson, M. (2019). Washington view: Lessons from Benjamin Franklin. Phi Delta Kappan, 100 (7), 72-73.